Istanbul or constantinopolis was the Belly button of the known world for centuries that impacted deeply in the roots of history. It has been an interest for holiday makers who come regularly to enjoy the daily cruising in the Bosporus area. Our yacht charter in Istanbul is suitable for daily cruising in the Bosporus. Enjoy cruising in Bosporus while staying in a luxury hotel in istanbul will stamp your memories that will be kept in forever! 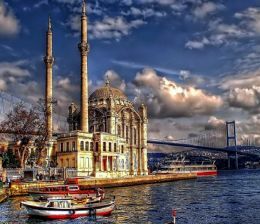 You are going to spend memorable days in Istanbul. We need to tell you that our yacht charter in Istanbul will take you in a wonderful trip on board of luxury yacht in the company of our professional captains. In fact, the Sea of Marmara and the Black Sea are connected with each other via the Bosporus. This is a great advantage that should be taken of during your visit to Istanbul. You can cruise on board of your luxury yacht charter Istanbul in the Bosporus that separates the Anatolian, or Asian, part from European part. This means that you are going to cruise on board of one important destination not only in Turkey but also in the whole world. Bosporus with Turkish hospitality is waiting summer enthusiasts to cruise in watery bordering line between two continents and enjoy the company of their lovely friends. You can reach us via email or phone to tell your preferences for your next holiday concerning yacht charter in Istanbul. Some students prefer to make their graduation party on board of a yacht charter in Istanbul, so that they can share the expenses amongst, especially when they like to charter for five or six hours starting from the sunset to Midnight. You might be interested in inviting your friends to a nice bosphorus evening, or you might prefer to spend a wonderful night with your loved one on board a motoryacht. our professional captains and the crew who have been for decades serving our clients who are interested in yacht charter in Istanbul. have devoted their life to help our customers with utmost care and attention. Daily or hourly yacht charter excursions in Bosporus is ideal in Istanbul. For more information, you can have a look at our yacht charter in Istanbul portfolio and choose the yacht that you and your company like the best to have your event, birthday party or proposal with luch or dinner cruising on board one of our luxury yachts. Just drop a line with your email and your phone number and tell us what exactly you have in mind and let us help you with best possible organization to make sure you donot regret to charter with us in the Bosphorus.